It’s February, the month of love. Valentine’s Day has passed, proposals have been made and accepted, and for those who are planning spring and summer weddings, it is rush season. I’ve met with three couples in the past three weeks to plan their nuptials. So far, only one couple I was involved with hasn’t stayed together. I comfort myself with the fact that I was more or less a sidekick in that ceremony, present to give a blessing to two former students. Both were practicing Christians, though I do not thing this had much to do with the fact that they moved to Splitsville within a year or so of settling at Wedding Bliss. Certainly, I have learned a lot doing these ceremonies. I have learned, for example, that it is Most Silly to send a small boy down an aisle with an empty pillow and call said boy a “ring bearer.” I understand the problem: Neither the groom nor the bride can be expected to trust a five year old with diamonds and white gold. Suggestion? Forget the fluffy pillow. Instead, have that endearing little boy walk down the aisle with his grandmother. He will be much cuter than the pimply teenager you thought of asking, and grandma will make certain he makes it down the aisle by applying a firm grip to his little hand. Not all children are willing to accommodate the adult need to find them adorable. By the by: You want adorable? Then please find that little girl a dress that will not slip off her little shoulders. You have no idea how often I see a four-year-old girl with a wardrobe malfunction á la Janet Jackson. Make sure you have enough music. At one wedding I officiated, the D.J. didn’t realize that the Beatle’s “All You Need is Love” simply would not cover the exit for the happy couple as well as twenty (yes, you read this right) bridesmaids and groomsmen. Three attendants on each side were left standing in a deafening silence after the last “love is all you need” faded out. Awkward. I have oodles more to say about women of all ages yanking at strapless dresses and bridesmaids hanging on the elbows of men they don’t know and may not like all that much. I have seen the Realization of Imminent Disaster as bridesmaids made ready, in outdoor settings, to navigate grassy aisles in spiky high heels. People invent funny ways of walking at weddings. But I shall cease declaiming. It’s February, and just after Valentine’s Day. Instead, I will indulge my super-soft romantic spot and remind all couples in the world, whatever your age, ethnicity, or sexual orientation, of the Important Stuff. Honor the hours before the wedding, don’t just rush through them. Take stock of the fact that your life is about to change enormously, no matter how long you have known your beloved. 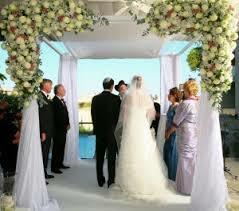 Consider the time under that chuppah sacred. Consider your marriage holy. It is. May it be sweet and richly blessed with all you need… love. Leaves are already beginning to fall outside my office window — even before they have turned. They fall because we have had another dry summer, another series of parched months. They are dying before their time. Every summer, as the Jewish Year ends, I sew new leaves of many colors onto our congregational chuppah. I started making the chuppah many years ago. For months I did nothing more than pull threads to make fringes on both ends. My first designs did not satisfy. I discarded one based on the sefirot. I removed a second try at the same theme. Finally, I discovered an abstract tree-of-life menorah on the Internet and used that as my inspiration. The chuppah features, at this point in time, twenty green-gold-orange-brown leaves. There are two for every one of the nine years we’ve existed. The year I was ordained as a rabbi, I sewed on one brown and gold leaf from the same material I used to make my tallit for the ordination ceremony. This past year, I sewed on an extra leaf for the smicha I received as a spiritual director. All the others are meant to represent the children of Temple Or Olam. Every year, two new new leaves. One for the boys and one for the girls. Every year there were new children. I sewed this year just after a baby naming for our newest member: Anderson Storch Everhart. I sewed, thinking about Anderson’s heritage. One side of his family goes way back in North Carolina’s history. Jonas, Anderson’s father, was born and raised first Lutheran, then Methodist. Shannon, Anderson’s mother, comes from Ashkenazi Jewish heritage. Her grandparents were Holocaust survivors. Her grandmother, interned at Auschwitz Birkenau, managed to hold on to life with a fierce, lion-like determination. After the war, Shannon’s gentle grandfather spoke about the Shoah. At every opportunity, he asked people to love – not to hate. Jonas and Shannon named their child Ariel, lion of God. 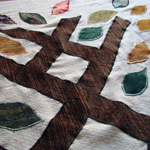 I chose the fabric for the boy’s leaf thinking about Ariel – about our people’s losses and our fragile gains. Our gains are – in my community – supported by many individuals who are not themselves Jewish but who are lovingly committed to our synagogue and our goals. I cut and appliqued the leaf for the girls and thought of Kalilah, who also joined us this past year. Kalilah dances at every service. Her hands lift and fall with regal delicacy. She is carrying heritage of many kinds in her richly dark hair, in her almond eyes, in her slim, tall body. Our children are the most eclectic mix I could have imagined for such a small congregation. Asian, African, European. Though they are being raised Jewishly, their parents include people who are Lutherans, Methodists, Baptists. The families I serve are as varied as the leaves on the trees in my backyard. Gold, orange, red, pale green, purple. I sewed the leaves on our chuppah wondering what I would do when we suffer our first loss. Perhaps I would sew a leaf at the bottom of the design, a fallen leaf for us to remember a loved one by. Someday, our chuppah will feature a veritable explosion of leaves at the top of the tree for all our children, all our years together. Would I begin a soft, small pile of leaves at the bottom of the chuppah to remember our lost loved ones? How could any one chuppah contain so much love and hope, so much sorrow and grief? I prayed over the chuppah this year. I prayed that when we hold it above our Torah at High Holy Days and gather under and around it that we will be blessed with all that it represents: Our diverse people and open community. May we in turn, bless, and may our blessings rise like warm air to help hold our chuppah high above us. In the face of all that has happened, after parched years and early death, we have grown back. We are, now, a tree of life.